This is a very very weird TV special. A lot of it is just impenetrable references and stylistic choices that made sense in the context of the day… maybe. It’s in black-and-white, and the definition on the DVD we watched was really sharp. Almost too sharp, it often emphasized the weaknesses in the writing to be seeing the actors so clearly. It opens with a rousing song about judgement day, and then proceeds to ignore the fact that it’s supposed to be set at Christmas for the next hour. It’s mostly about Crosby wandering around England in search of distant relatives, making thin excuses for cameos by British singers and actors. He looks sort of dazed or drunk, often glancing off-camera as if for a cue card. However, I think this is generally just part of his shtick. We start up the main sequence with a long sequence in a tea shop, with a selection of songs and lazy choreography. Some of the jokes are almost cute if you’re in the right mood. Next Crosby runs briefly afoul of the law for busking, and there’s another excuse for a song in a boring courtroom sequence. The comedy sequence with a genealogist had a few laughs in it, the poor character actress playing a street artist didn’t really have much to do. Shirley Bassey does some awkward lip-syncing in an uncomfortable looking dress, and we’re finally in the home stretch. Crosby arrives at his “aunt’s” tavern, we have some ‘lovable local’ types and some good old-fashioned Irish jokes, and Bob Hope arrives to mug a bit for his cameo. Finally the special closes on what else? "White Christmas." 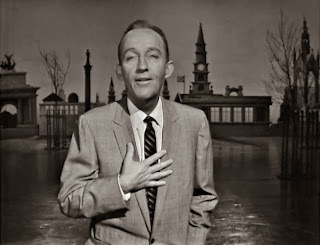 This supposedly set the stage for all the multitude of Bing Crosby holiday specials that came after it, but outside of that context, there’s really no reason to watch it today.